Introducing the 18" LONG METAL SHOE HORN made by Comfy Clothiers. 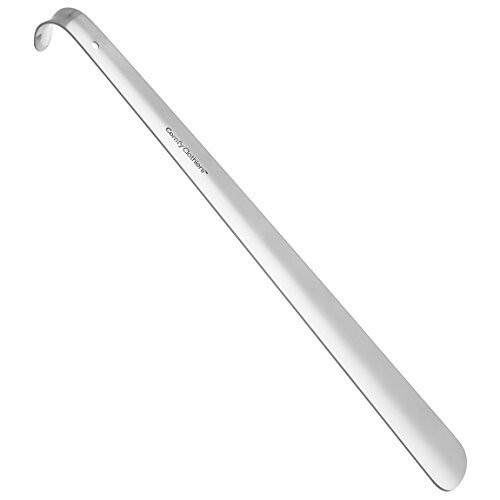 This shoe horn is made of HEAVY DUTY STAINLESS STEEL to never let you down when you need it most! Our long-handled shoe horn is thicker (and heavier) than every other comparable shoehorn on the market today, weighing in approximately 200 grams - whereas most other 18-inch shoe horns weigh between 100 and 120 grams. The extended length of this shoehorn will enable you to put on and take off your shoes easily without having to bend over. As such, it's GREAT for anyone who is RECOVERING or REHABILITATING from a HIP or KNEE SURGERY (post-surgical) and also works great for anyone with ARTHRITIS or just general aches and pains when bending over to put on shoes. Please note: The full length of this shoe horn is approximately 18 inches but that does include the curved handle. When you account for the curved handle the shoe horn measures approximately 16.5" in length from end to end as with most other "18-inch" shoehorns on the market. The perfect GIFT IDEA, this shoe horn is designed for easy storage with a hole on the handle for hanging on your wall, in your home, closet, office or can easily slide in your vehicle for quick access. Also works well with boots and golf shoes! If you have any questions about this product by Comfy Clothiers, contact us by completing and submitting the form below. If you are looking for a specif part number, please include it with your message.